Yes, very much so, written in assured, quiet and unpretentious prose, on this I can completely agree and because of that, Tell was none other than quite simply, a very lovely read. It begins in the year 1920 in a room where an unnamed woman is giving up her child to a younger couple. The new father covers his face with his hat and goes out into the street, holding the door open for his wife and new child. The ending of this novel will reveal the identities of this unnamed woman and couple. 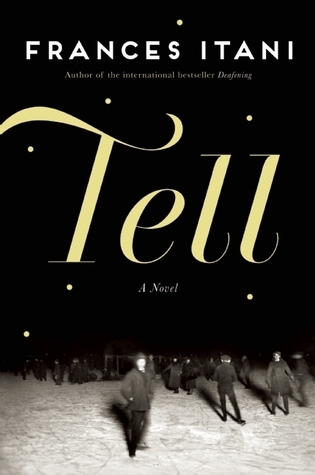 Tell is the story of two couples at vastly different times and stages within each of their marriages. First is Kenan Oak and his wife Tress and then Am and Maggie O’Neill. Am and Maggie are the uncle and aunt to Tress. Kenan has just returned from the Great War disfigured and permanently injured – he’s lost one eye, his face is terribly scarred and he has no use of his left arm. Am and Maggie are also fighting demons of their own. Kenan is returning to the small town in Ontario where he was raised, grew up with Tress and later married her, doing so just before enthusiastically enlisting in the war. He returns to Deseronto in a vastly different state of mind, as so many of those returning from the Great War do. He never leaves the house, only beginning to venture out in the dead of night after many months in hiding. He and Tress are finding it difficult to fill in the lengthening silences that are filling their home. Slowly, Kenan ventures out into the town, but only at night, and after receiving letters from Hugh, one of his best friends that he fought alongside with “over there” and whom is recovering from TB. These ventures and letters evoke many memories for Kenan, those of his childhood and those from the war, including the most painful ones of losing their friend Bill. He longs to share these letters and memories with Tress, he just can’t figure out how best to do so. Tell is also the story of another couple growing further apart from one another, with no understanding of how to try and close their growing silences. There are simply too many secrets hiding in their past and not spoken of that make it difficult to draw closer together as they once were. Am and Maggie are struggling with their past demons and while both long for the days when they shared such great and strong love with each other, but now, too much time has passed and they don’t know how to bridge those gaps. Their growing distance from one another culminates in an unexpected event. There are so many moments of poignancy shared within the pages, it could easily fill the page, but Tell, with its quiet and unassuming story of how the Great War affects just this one small Ontario town and its varied inhabitants should be read for oneself to experience. Interspersed between chapters are pages taken from the Deseronto Post, with news of events and goings on around the town. At the end of each one is a small “ad” for products, such as “Perrin’s Pine Tar Cordial: Don’t neglect the cough.” This only added another small and lovely touch to this story. It also makes for the enjoyment of reading the hard copy of the book a lovely choice over an e-edition, in my opinion. 4 stars for this elegantly told tale.